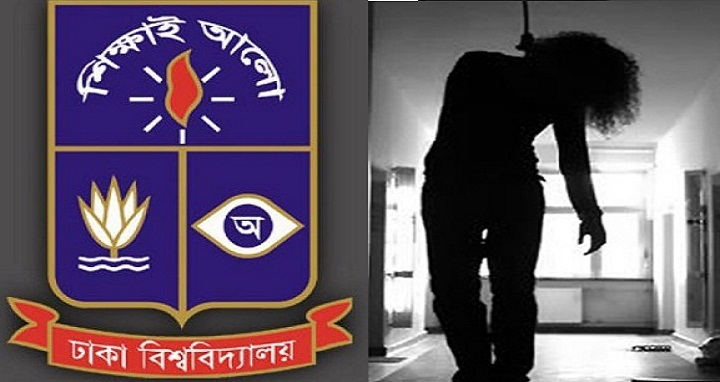 Dhaka University, July 20, Abnews: A female student of Dhaka University (DU) on Thursday has allegedly committed suicide by hanging herself from a ceiling fan in her home at Dhaka’s elephant road area. The deceased was identified as Maria, 20, a second year student of DU’s History department. The body was taken by the family to Dhaka Medical College and doctor announced her as dead at 7.30am. Mabia, elder sister of deceased Maria, said that they live in ninth floor of 19 storied Concord Tower in elephant road. The reasons behind the suicide still unknown. SI Baccu Mian, DMC police box in-charge, has confirmed the matter. ''The dead body has kept in DMC morgue''.